HCM CITY — The Cửu Long (Mekong) Delta, the country’s rice granary, expects to harvest around 11 million tonnes of paddy this winter–spring rice crop, one million tonnes more than last year, according to the Ministry of Agriculture and Rural Development. The region has planted 1.6 million hectares and expects an average yield of 6.66 tonnes per hectare, 454kg higher than last year. Fragrant, specialty, and high-quality rice varieties have been planted on around 62 per cent of the total area, glutinous rice varieties on 9.8 per cent and other varieties on the rest. Farmers have already harvested more than a fourth of the crop, earning profits of VNĐ25-40 million (US$1,100 – 1,800) per hectare. Speaking at a seminar held in An Giang Province on Wednesday, Deputy Minister of Agriculture and Rural Development Lê Quốc Doanh said the winter–spring rice crop has achieved a bumper harvest and rice prices are high. Several provinces like Đồng Tháp and An Giang and Cần Thơ City have achieved much higher yields than in previous crops, he said. To protect the crop, he instructed the Plant Protection Department and local plant protection sub-departments to carefully monitor the weather for unseasonable rains and storms and promptly take action in case of a bad forecast. Rice diseases should be controlled, he said. He also instructed authorities to set clear cultivation schedules for the coming summer-autumn and autumn-winter crops to protect them from brown plant hoppers and saltwater intrusion. The region should increase the cultivation of fragrant and high-quality rice varieties in the summer-autumn crop to meet export demand, he said. The delta plans to grow 1.65 million hectares of rice, the same as the last summer-autumn crop. 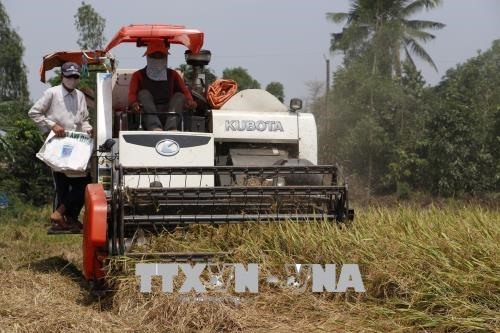 The Cultivation Department has instructed the delta provinces and Cần Thơ City to sow the summer-autumn crop between April and mid-June to reduce the damage by brown plant hoppers and saltwater. Areas along the Tiền and Hậu rivers in Đồng Tháp, An Giang and Tiền Giang provinces and Cần Thơ City, a part of the Long Xuyên Quadrangular and the area north of National Highway No 1 in Vĩnh Long Province will plant the crop in April. Areas south of the highway in Vĩnh Long, Tiền Giang, Hậu Giang, Sóc Trăng and Trà Vinh provinces will plant in May. Areas that rely on rainwater for irrigation in Long An, Tiền Giang, Bến Tre, Kiên Giang, Cà Mau and Sóc Trăng provinces will begin in early June. The delta should secure water to irrigate the summer-autumn crop since saltwater intrusion has already occurred in coastal areas, according to the ministry’s Irrigation Department.